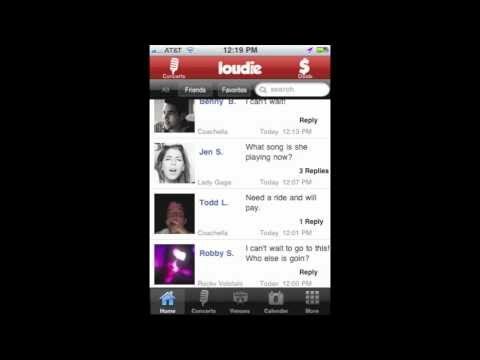 Having launched about a month ago, just in time to provide Coachella attendees with free pizza for checking in, a new location-based live music app called Loudie hopes music fans don’t want to use popular networks like Facebook or Twitter to connect with each other at shows, but will instead rely on the company’s free iPhone (and soon Android and Blackberry) app. Unlike Twitter, which lumps all communication into a big heap, sortable by user and hashtag, Loudie creates a separate feed for each show at each of hundreds of thousands of venues. This gives even technologically-unsophisticated (or -unenthusiastic) users a much easier way to communicate with each other at specific shows. In return, they can earn “credentials” that can be redeemed for free tickets, music downloads, merchandise discounts, and other prizes, although the emphasis is on giving people at the same show (as well as curious people in other locations) a way to chat about and share photos from a specific show. We’ve all noticed that trend, of course — not only at music concerts, but everywhere from the subway to the highway. However, Dashoff decided something was missing from current technologies where music fans were concerned. He’s gambling that live music makes sense as a standalone location-based category, separate from general networks like FourSquare, Facebook, Loopt, Gowalla, and Twitter. Show-goers already share images and other content from live shows directly with their friends using those general purpose tools, including private ones like email and SMS. However, even when posting publicly on Twitter, they tend not to use the same hash tags as other people at the same show, which makes it tough for them to find each other in Twitter’s vast sea of messages. Loudie promises to solve that problem — but it won’t matter unless the app can grab a critical mass of users, and that’s easier said than done (Dashoff declined to share usage numbers from Loudie’s inaugural month). Any developer of a new, location-aware social network faces a big question: Why shouldn’t this just be a feature within Facebook, Foursquare, Gowalla or Twitter? In other words, does live music really need its own location-aware social network? New social networks of any type face a steep climb because they don’t mean anything unless other people are using them too. But whether it takes off or not, Loudie has already taken us one step closer to becoming mayor of a band.